Micro Green brings recreational Marijuana to the dining table in an elegant, refined way. Each bottle of Micro Green THC infused olive oil spray is designed to deliver a precise dose of relaxation to whatever food you wish. Micro Green comes in four delicious flavors: Extra Virgin Olive Oil XJ-13, White Truffle White Widow, Sichuan Peppercorn Space Queen, and Citrus Lemon Kush. Our flavor assortment allows you to enhance a wide variety of foods with medical grade, sativa/indica hybrid Marijuana. Spray 1, 2, or 3 times for low, medium, and high level of relaxation. With Micro Green, you’ll always have a sophisticated way to indulge and unwind, right there on the table. After all 50 states declared recreational Marijuana legal, the green leaf has become completely normalized as a preferred recreational substance, giving alcohol a serious run for its money. But for as long as people have been inhaling Marijuana, they have also been eating it. 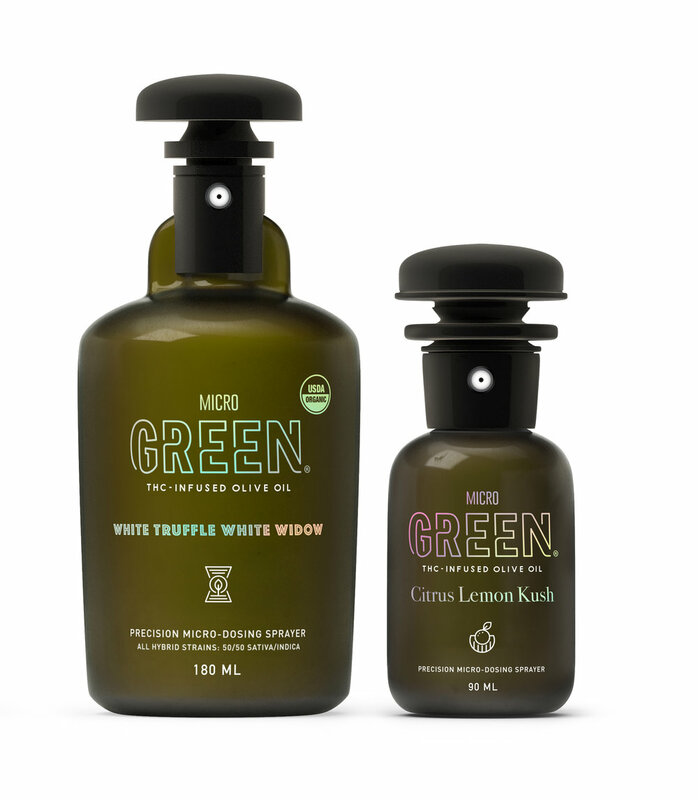 Micro Green is a spray bottle based condiment containing THC-infused extra virgin olive oil designed to be sprayed on food. Each spray delivers a precise burst of 5mg of THC, allowing for a fine level of microdose control. Micro Green is delicious on so many foods: pizza, pasta, salad, fish/poultry, meat, and more. Spray once for a gentle touch of relaxation, twice for a bit more, and three times (or more) to completely unwind. Micro Green brings Marijuana to the dining table in an elegant, refined way. The bottle is designed to sit unassumingly on the table amongst the salt and pepper shakers, with the gentle sound of mist spraying heard throughout restaurants and home dining rooms everywhere. The edible Marijuana experience has been completely normalized in the food world. The spray dosing system helps the user control exactly how much Marijuana they consume, preventing over or under dosing. Like with alcohol, everyone has a personal limit for how much they want to indulge in any given situation. Micro Green’s dose control allows the user to get exactly the amount of relaxation that they want. Micro Green was inspired by the following movements, technologies, and trends in food today. Cannabis Cuisine: After all 50 states declared recreational Marijuana legal, the green leaf has become completely normalized as a preferred recreational substance, giving alcohol a serious run for its money. But for as long as people have been inhaling Marijuana, they have also been eating it. The proliferation of more sophisticated Marijuana based edible products that eschew the low-fi, homemade look and feel of products past have given people much classier ways to indulge.